ShortScale :: View topic - What kind of screws to mount a six-screw Strat trem? What kind of screws to mount a six-screw Strat trem? 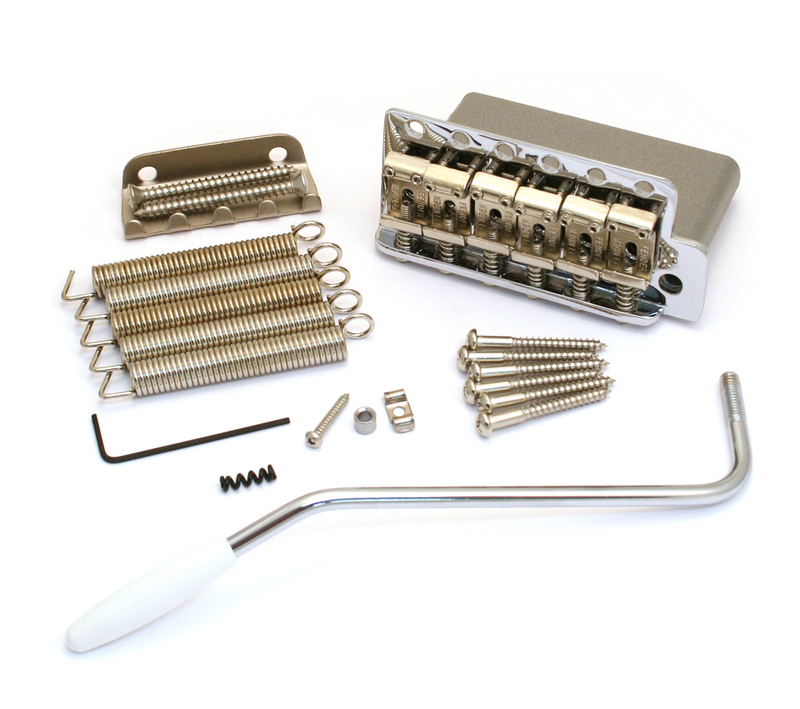 Posted: Thu Mar 05, 2015 4:57 pm Post subject: What kind of screws to mount a six-screw Strat trem? Silly question. I have a Strat project which has been apart for a while, and I seem to have lost the bridge mounting screws when I moved last year. The bridge, I believe, is the same as an AV Strat from the late 90s. I found some screws, but...they're clearly not the right ones. I think they're too short. I strung it up, and it was fine, until I started testing the trem. After a few bends, I heard a loud POP, and the whole guitar went out of tune. The screws had pivoted forward, shifting the entire bridge forward, so much so that the pickguard won't fit over it anymore. Hopefully I don't need to fill and re-drill the holes now. Might be getting a new bridge, if so, but for now, what does a typical Strat trem mounting screw look like? Edit: It occurred to me to just look at a picture Found my answer. Yes, the screws I have are much too short and nothing like these really. It's pretty important that you get cancellous ones because fully-threaded screws will make the trem stick at funny angles if you use it (which is probably what your POP was, I hope the body is ok). The unthreaded portion is where the pivot occurs, so you also don't crank even the proper screws down too tight, it'll just lift the trem. You basically make it flush with the body and then just close the gaps between the screw heads and the bridge plate. I'd just buy something advertised as Strat trem screws to save bother. I have a 2001 AV and could measure one for you if you really want. The AV Strat trem is the best vintage-style one money can buy IMO, it's important that it's properly installed for a good trem setup though. Cheapo Strat trems slapdash-edly drilled onto a Squier body just before lunch tend to contribute to tuning woes. If the short screws marred the OG holes I would fill them with Plastic Wood, put a real thin guide hole in and very carefully tap them with the screws. A drill press would be best, or some kind of guide to ensure proper 90 degree drilling at least. Hah, I didn't think to see if they had the screws alone. Thankfully I found the original screws. I was worried about the body, too, because yes, the old (incorrect) screws did pivot and got stuck at a funny angle. But after removing the bridge, placing it back where it belongs, and mounting it using the proper screws, it works great. No tuning problems, and it returns to pitch perfectly. Might be my new "main"!